Article Description: Romanian artist Daniel Chiriac paints oil on canvas. 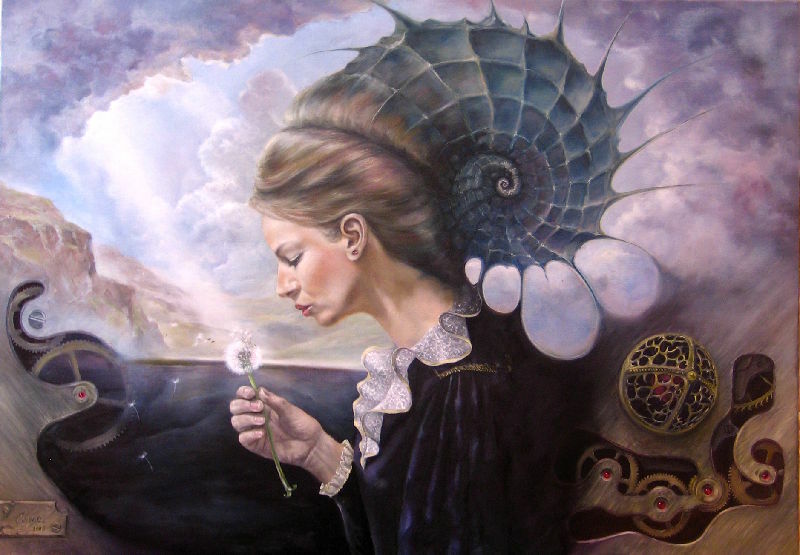 His preferred styles are surrealism, fantastic realism and classical realism style. Most of his time is dedicated to his little daughters and wife and of course, creating art. Here today, he brings to us his story complete with personal anecdotes and insight relating to his experience creating life as an artist. Daniel Cristian Chiriac, born 1972 in Romania, paints oil on canvas. 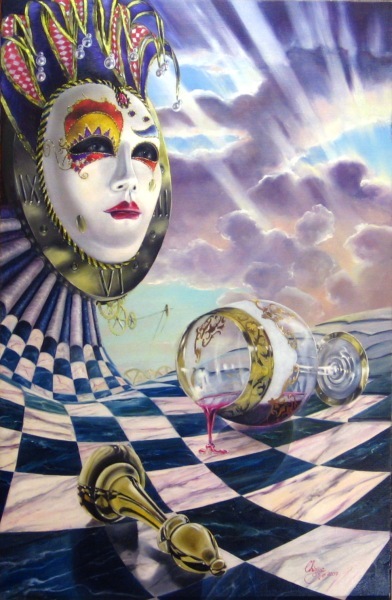 His preferred styles are realism and surrealism. After a long period of abstractionism (before 2006), Chiriac rediscovered the beautiful paintings of the old masters. Being more and more interested in the old masters techniques, he slowly abandoned the abstract art style and turned to surrealism, fantastic realism and classical realism style. Most of his time is dedicated to his little daughters and wife and of course, creating art. Here today, he brings to us his story complete with perspicacity and personal anecdotes relating to his experience of life as an artist. What is the story behind the works you wish to focus on "Till the end of time" and "The last love of Don Juan"? Well, it's not so much the story behind them than the fact these two paintings are my favorites. "Till the end of time" is a painted love poem to my sweet lady, Daniela. She is the sitting model for my painting. The picture is a symbol of time evanescence. Being so, all that counts in the end is love which must be preserved along the years. This painting is also my first conscientious attempt to deal with the golden proportion. I never ever, before or after this have done so many calculi for a single composition! Who's that to tell that love isn't mathematics?! Well, my love is mathematics... Daniela is a math teacher. - What if Don Juan didn't go to hell after his last "love"? What if Don Juan had stopped flying from one flower to another? According to the legend of Don Juan, he didn't stop seducing women and his end was in hell... but, being myself a romantic type, I thought that, in certain circumstances, Don Juan could have also been seduced and so, to find “the only one” that was truly for him. This is the subject of my “The last love of Don Juan” ...well, I think that the title should be “The only love of Don Juan” because I think all his “activity” was only a performance not love because I do believe in true love comprised of devotion, respect and sacrifice (unfortunately, so depreciated in these days of exacerbated egoism)...and therefore this is my version of the legend of Don Juan ending: I think that Don Juan could found his true love with divine help only. 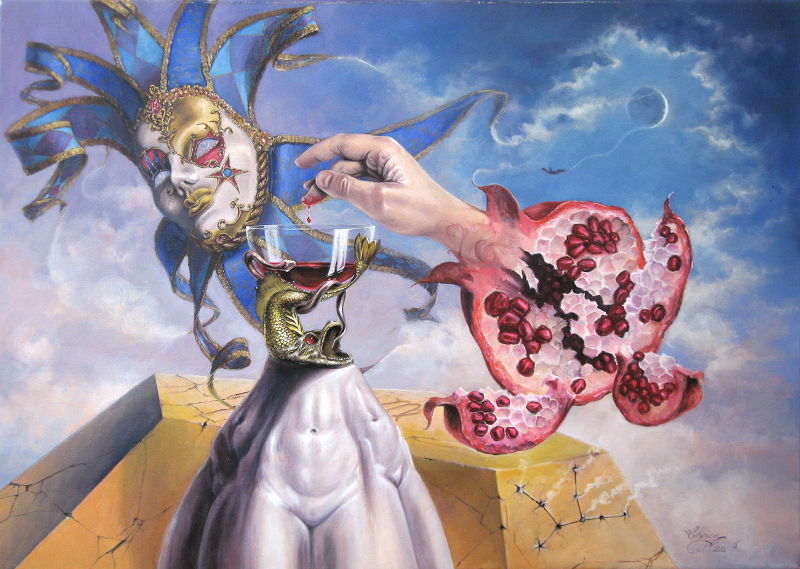 The foreground sculptural element including the chalice, the hand and the pomegranate, represents the life of Don Juan as we knew it: full of lust, carnal pleasure, in a continuous hunt to feed the personal pleasure, all of these, under a demonic influence. With divine help - which is represented by the dodecahedron which is a symbol of the heaven substance (according to Aristotle) - Don Juan found a woman who embodied all the meanings of a virgin (note the Virgo constellation on the dodecahedron). Only a perfect Virgo could “capture” the soul of Don Juan, I think. After that, Don Juan realized that his previous life was just a mask and casts it off and then flew for his love on a silver string to the Moon. The Moon itself is at the first quarter which means that the new love is growing. I don't know if what was in my mind is well transposed onto the canvas, but I hope I managed to do it at least a half of that. Actually, when is about influence, I can't give a particular name I very much like Caravaggio and he influenced me. Then there are various Old Dutch painters. But, the main influence in my realist art comes from contemporary realist artists who I think are better in depictions, yet, maybe not as good on the crafting-side of making a painting. I mean by that in regards to the use of techniques that ensure a very good and long preservation of paintings. Maybe since I was 16 or 17... not sure exactly, but I'm sure I was thinking that I have artistic skills. This was also a time when even though I wasn't drawing a single line I considered I made art simply by walking on a street or talking to friends. My mind was way way too open to what art making is. Anyway, I became confident that I'm an artist when I began making a living through art. Oh, that's so far in the past ! I was a child... Was I seven or eight? Not sure exactly what my age was when the family friend, who also is the one who initiated me in art, made me a gift box of oil color tubes. He gave it to me and nothing more. No instructions, no guidance ... nothing! As you would give a chocolate to a kid and it's something obvious that kids know what to do with. Also, he didn't give me a canvas so that I painted my first oil painting on paper. That kind of paper you can find for children's watercolors. Had no thinner either, so of course, my brushes were ruined. I remember that the greatest surprise was to see how long oils take to dry! And also, how many things get dirty ...I still remember the subject was a still life of a handcrafted vase having some roses applied on it like a high-relief sculpture. In the vase were roses, too. It was my "early masterpiece" a thing for my mother to praise to her friends long afterwards. Well, quite surprisingly for me, I liked that painting, too. It's a rule for me not liking my paintings more than a few weeks ...well, with 2 - 3 exceptions. Things that I think are beautiful. And that can be everything. It depends by the artist's eye. After all, isn't the artist's job to identify beauty where the ordinary eyes see nothing but ordinary things and so, to bring them face-to-face with that beauty through the work of art? I remember a funny situation about a thing that inspired me. Well, it's true that it was when I was abstractionist, so I've got excuses. So, being at toilet and having nothing, I saw some cracks in the walls with ceramic tiles and found that design interesting. I looked over them, canalized then and came to the conclusion there's a nice subject for a painting. If you look over my abstract gallery, you will see a polyptych painting (4 pieces), green colors predominant, few of reds and blues. That's the resulted artwork inspired by the crackled bathroom ceramic tiles. Well, I believe that an artist is to bring up to the worldview beauty, simply beauty as the main rule. The rest must be a rare exception. I think that what doesn't fall under this rule is not art. As I think that an artist's eye must be trained to see beauty, I don't try to convey nothing but beauty and this means the whole philosophy to me. No other philosophy, not any alembicated discourse like "spotted in light of art, anchored in the synergy of facts, the recourse to reality, do not elude the meanders of concrete space." I'm walking at vegetable market and see a tasty sweet pepper for soup; I see a nice still life painting. Also, like the answer to the previous question, one may only see some cracks in the tiles, I may see a painting. So, my mission is to reveal the beauty there where no other eye sees it but the artist's eye does. Day after day, night after night, I keep ideas on the first support I may find when the inspiration strike. Most of time, the only available support is my own memory...which, unfortunately, is not my best support for the purpose. So that way many ideas are lost for good. Although, I have stored a lot of ideas on written notes or fast sketches. Funny thing is that, so often I don't use that pile of ideas to start a new painting but the most recent idea that struck me. This why an artist must be a monk if he want almost all his ideas transposed onto the canvas (or any other support... or else learn to paint much faster, not so slow like me. As I said before, ideas come from all over the place from the restroom or vegetable market, to the actual reality at dream reality. When it is about realist paintings, I set down the model, I do the composition, and then I start painting. Quite simple. I don't make multiple compositions to choose from as I'm confident on my first impulse. Painting process itself is a love / hate activity for me. Until 2006, all of my life, even as a kid, despite suggestions of that early mentor who gave me the first oils and who really hated abstract art, I loved abstractionism and I created accordingly. Well, there was such a joy to paint so! On good days (OK, nights) I had been painting 2, 3 or even 4 paintings! The main problem was that that joy was short lasting....like an energy drink.... There's only one painting from that period I still like - Solar Incandescence. Since surrealism and realism, I almost hate painting process itself because it's so slow - 2 days for a small ACEO miniature (2.5 x 3.5 inches) to sometimes months for large paintings like "Till the end of time". The reward of this pain comes greatly when the painting is ready. Yes is true, the joy of picture I have done disappears eventually, but it lasts much longer and gives me much more satisfaction and gives me a complete feeling and confidence that I'm really an artist. I didn't see much difference between me and a carpet designer when I was abstractionist (forgive me carpet designers). When it is about surrealism, an idea becomes sketch then sketch a preliminary composition drawing. Then I search for models of objects in my surreal composition. If human bodies, it's time for photo shooting session: me, my wife and my children. If objects of any kind, a photo shooting too. Of course, there's always need for hand drawings as well. Then, to speed up the process, I use my computer to mock up from photos and hand drawings into an image as close possible to the final painting picture. I may or not (most often, not) do some color studies. With that image on the display monitor, I start drawing on a paper at the same size of canvas. I make changes if I feel it is needed, I transfer it onto the canvas....and ...again, the slow process of painting starts. No matter realist or surrealist, when I get the painting ready, I hide it from my view for a day or two then, I hang it on the wall. If a week or so passed and nothing on the picture "scratched" my eyes, I then consider my job done and I sign it. I had no live exposure, I mean no show in brick and stones gallery. And this is because I never could keep the required number of paintings for a show. Internet is my gallery and place for competitions. Yet, I didn't apply to online paid competitions as I'm not a gambler. There are so many wonderful artists applying so that you must be lucky to win even when you're very good. The most beautiful recognition for me is when my customers send me pictures of my paintings hanging on their home walls along with enthusiastic thanks. What has been the most unexpected reaction your art? It happened recently. 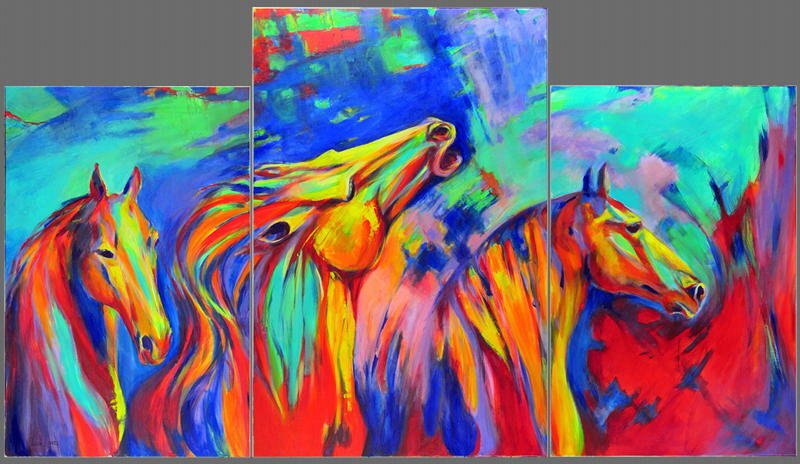 Someone found my website last year (2012) and was amazed by an abstract expressionist triptych of 3 horses that I painted many years ago. She sent me a very surprising email according to which I'm quite a genius, at least at that moment of creation. I was very surprised by such a flattering feedback moreover finding her graduated from art academy. After this all, I had a commission. Even though I had stopped painting abstract long ago, I accepted her commission and I started painting it. She wanted me to paint for her something of same subject, same manner. I've told her it won't be a copy. Something looking like it at most. I was very excited as I had rediscovered the joy of abstract painting. So excited than I didn't see my work in an objective manner...she told me to "go wild" onto the canvas... and so, thinking that the painting was finished, I sent her pictures of it. It wasn't the most pleasant reaction. It seemed it would be better if I had been done a copy...which I can't. I may have...Not so sure....Because I don't know if my life would be the same now... and my life it is. So, if it be to call this a regret, this is the fact that I didn't go to art academy. When I finished up high school, I thought about what I wanted from my life and I decided I want to get rich. Soooo, I went to the Law school, where else to go in order to get rich without a dead rich relative. I was a good law student until the true calling emerged and made law study impossible for me. Hardly, I finished that school but I never practiced. Even though I consider art school not something a painter must do, yet it offers an impulse for sustained work. You know, a natural gift is nothing without training and when nothing but your own will and self-determination put you to work, the chance to become lazy is quite big. Plans... I want my realist art to be good enough to get short-listed at the artrenewal.com annual painting contest....well, and at the BP portraiture contest (UK). I also want to do a first one-man-show in a real gallery. I don't strive for that, but I want to take the only advantage therein of a regular job: sure and constant salary. Yes, I've got a job. Times are hard for making a living from art only. Keep hard at work always practicing and learning from any source. Promote your art as much as you can but keep watch on time spent on it. There are so many promoting a lot and creating less and so coming to a point when there is nothing new to promote. Be more artist than advertiser. Keep watching for artists you think make art better than yours. Don't strive for a "personal touch." Strive for a better technique first then that thing which makes your art unique, that cognoscible personal touch will appear naturally. As I told you above, I was student of Law school and during that period I barely picked up a pencil. So, my girlfriend, my lady today, didn't know about my artistic background. I didn't tell her a word about it. After almost an entire year since our coup de foudre, my change back to art resurfaced and I painted a couple of paintings. One day she visited my home and I showed her my work telling her my plan to make a life as an artist. A few seconds after, she was weeping silently ...and this was not of joy... 5 years later I married her. How do you promote your art both on and off the internet? Nearly all of my collectors are outside my country. I do promote myself locally too in my small city. The local gallery curator still awaits my paintings for a show. I was close to achieving that 3 years ago, when I managed to keep all the necessary painting less 4 or 5 more, when my first baby girl was born. This event needed money... so I had to sell all my available paintings and so the show was postponed. 99% of my promotion is done on the Internet. 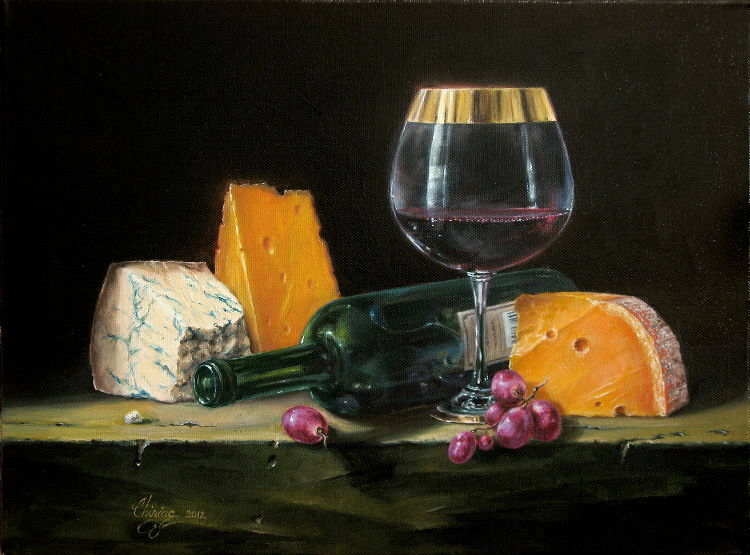 Here are links to my FaceBook page and YouTube channel and visit my main site Daniel C. Chiriac – Fine Art Gallery.